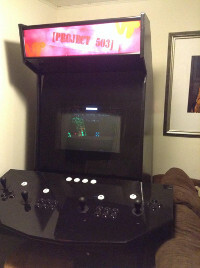 In 2003, after one of my coworkers built an arcade machine, one of my roommates and I built an arcade together. As an architect with access to a full wood shop, he modified the plans to fit our desires and cut out the cabinet pieces. We worked together on assembly. I painted, wired, and provided the computer inside. The cabinet provided many years of enjoyment, both during my tenure at the legendary 503 #3 Center Street and post graduation. However, around 2011, the hard drive in the arcade computer started showing signs of failure. Everything on the machine was very out of date as well. It was time for a new arcade brain. I replaced the purchased in 1998 computer with a $200 “nettop”. However, I was never able to get all the elements as slickly integrated as with the original system. It was bad enough that another roommate reloaded the computer with a Windows-based system. It didn’t work well either. Fast forward to 2014. The machine at the office was getting a rebuild and I used it as an incentive to rebuild mine the right way. Since I had many false starts along the way, the following steps may not be 100% complete, but are designed to help you replicate my success of using mame and AdvMenu on Ubuntu. I’m currently running Ubuntu 14.04 LTS in 64 bit desktop mode. You must be running a Debian or Ubuntu distribution for these steps to work.